Horsehair braid is a type of crinoline netting and is used to provide structure and give body to hems, hats and sleeves. It’s one of my favourite notions and it gives truly amazing results. Even better – it’s ridiculously easy to apply! 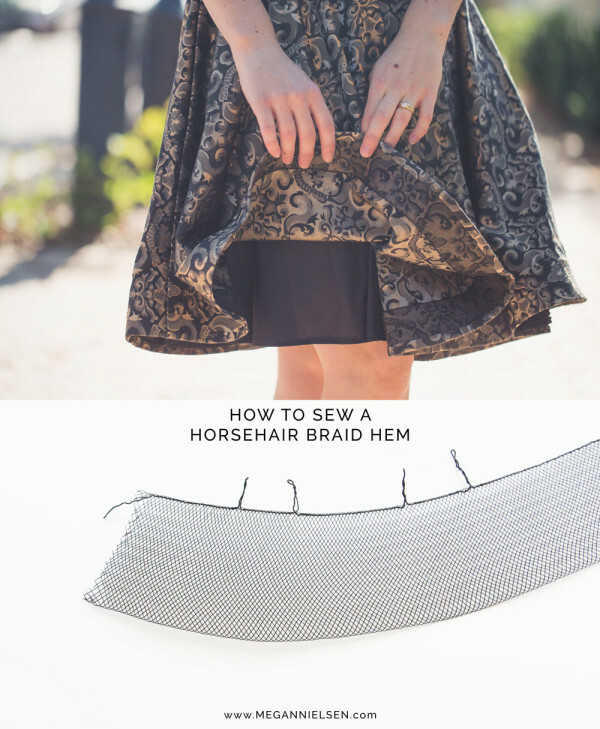 I’ve been finishing up a brocade Brumby skirt for Perth Frocktails this weekend with a horsehair braid hem, and thought i’d share a little tutorial for how you can apply this finish yourself. Isn’t there something so fun about mashing up sewing patterns?? 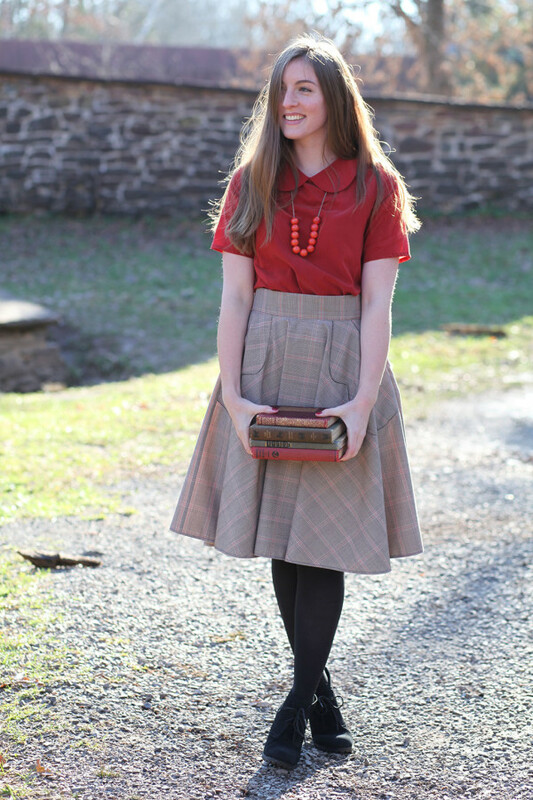 This is a combo of the Alissa pattern (Version 3) and the Veronika skirt (Version 3). I really love how it turned out! I combined a medium top and a medium skirt and i think they melded really well! It was nice to take what started out as a maternity crop top and turn it into a nursing dress. Unfortunately it doesn’t fit as well as well as it used to, that’s always the hard thing about the year after baby is born, so many weight fluctuations. I should probably take it in, but now that i’ve weaned Birdie i’ll be getting much less use out of this dress, so i kind of don’t feel like it. That sounded lazy hehe. But it served me really well for a year, and i think it’s okay to say goodbye now. Right?! A lot of people have asked me about whether the neckline stretches out after nursing – to be honest, i haven’t had this issue at all. This dress has had a lot of wear, and i think the neckline still looks really good. I think it’s important to choose a knit with good recovery, and that will really be your saving grace. If you’re still worried you can always sew some elastic into your neckline to stabilize it and help it recovery – lingerie elastic is probably the nicest choice as its soft and thin. 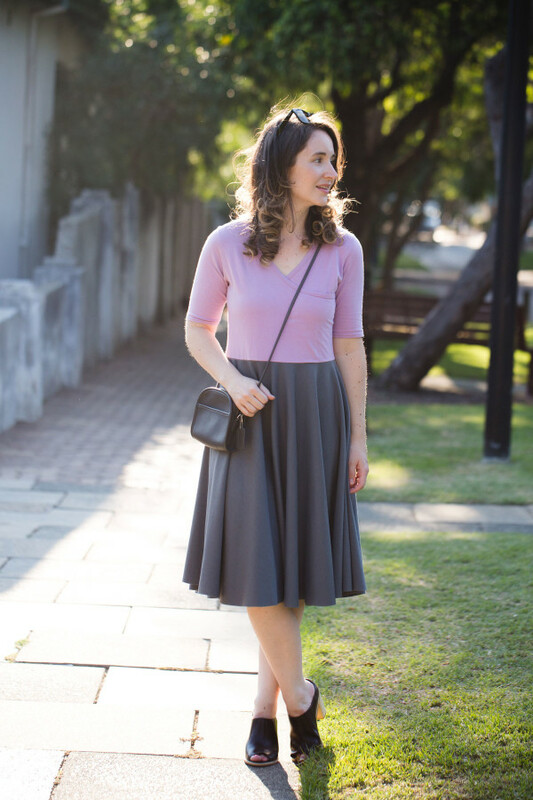 If i did this again i think i would try combining the Alissa V3 with the Cascade skirt – wouldn’t that be rad? I think i’d also ruche the sides of the top for something a little different. And you know, RED, so i would look like that cha cha emoji. Ok now i really want to make that! ha! I’m sure this happens to many people – but i have a rather large section of my wardrobe that i don’t wear anymore because it’s just not really appropriate for my lifestyle. Cocktail dresses, suits, sky high heels – i love it all, but most of those pieces don’t have a place in my life at this stage. And that’s ok! 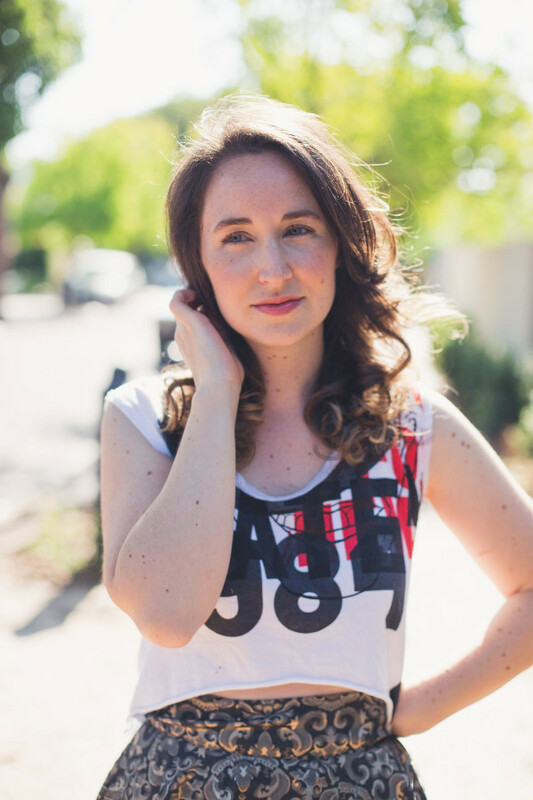 Life has lots of stages, and i love the way my style has evolved – but i can’t help mourning some pieces i no longer have an excuse to pull out. 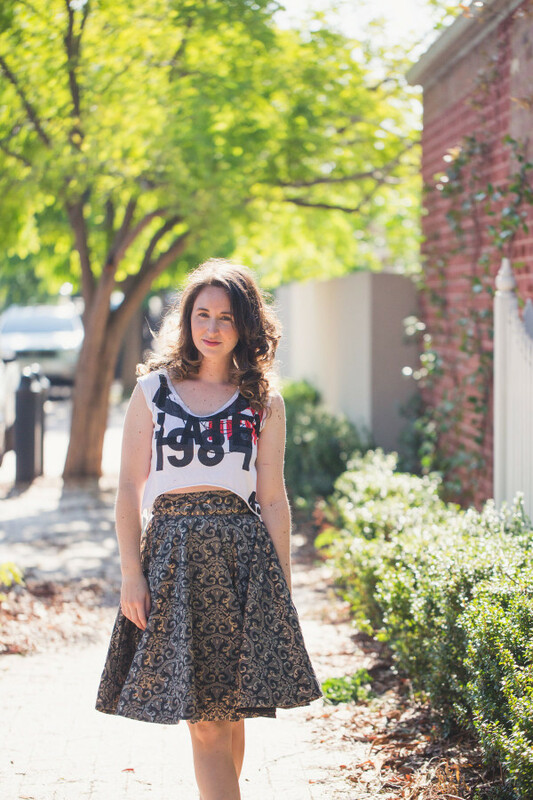 This skirt falls into that category. I adore it, but the way i’ve worn it in the past wouldn’t make sense these days. Can’t see that at school pick up right?! hehe. But i can’t seem to part with it. Which means it’s time to find a different way to wear it! 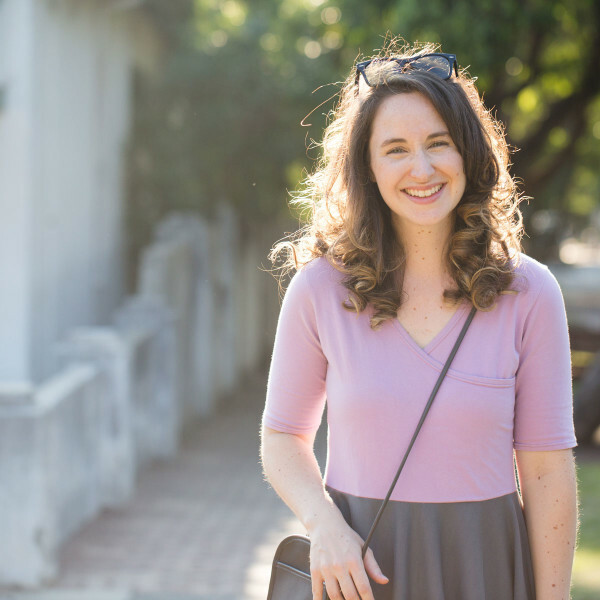 This kind of styling fits my life a lot more now – cropped Briars are my staples, and flats are a necessity for all the walking i do. 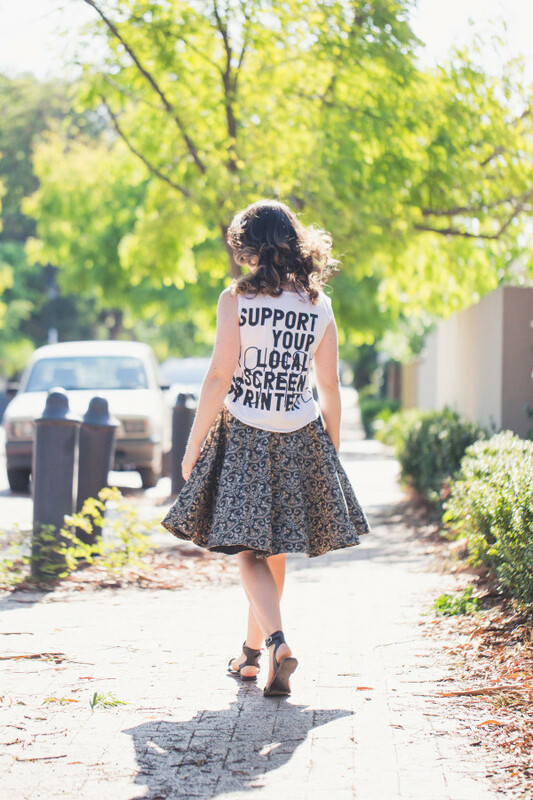 Perfectly honestly, I still prefer wearing skirts like this in a more formal put together way – but i think sometimes you just need to roll with reality! I’ll kind of take any excuse to wear this Briar too – amazing how it’s become such a staple for me. Here is how i made it from a tshirt and here is the neckline finish i gave it. 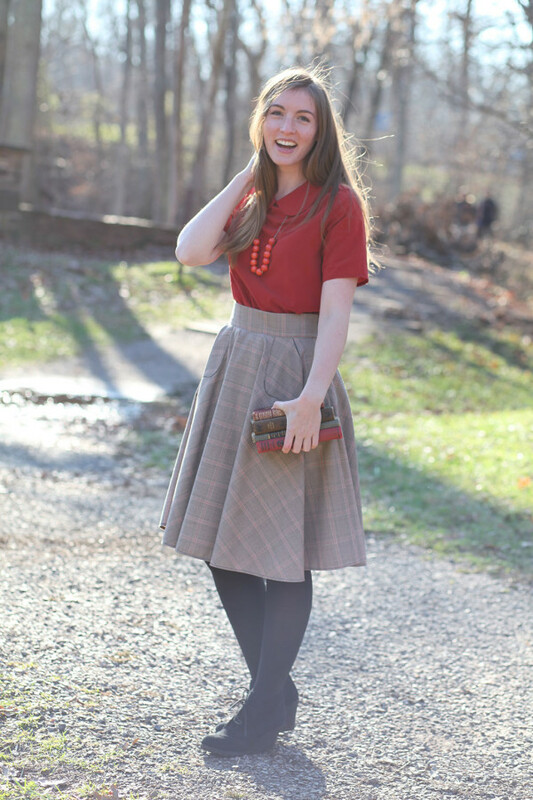 One of the things i have always loved about this particular skirt is the hem. It’s finished with horsehair braid, which adds just enough body and fullness to make the hem really pop. I really need to use horsehair braid more often, definitely one of my favourites. 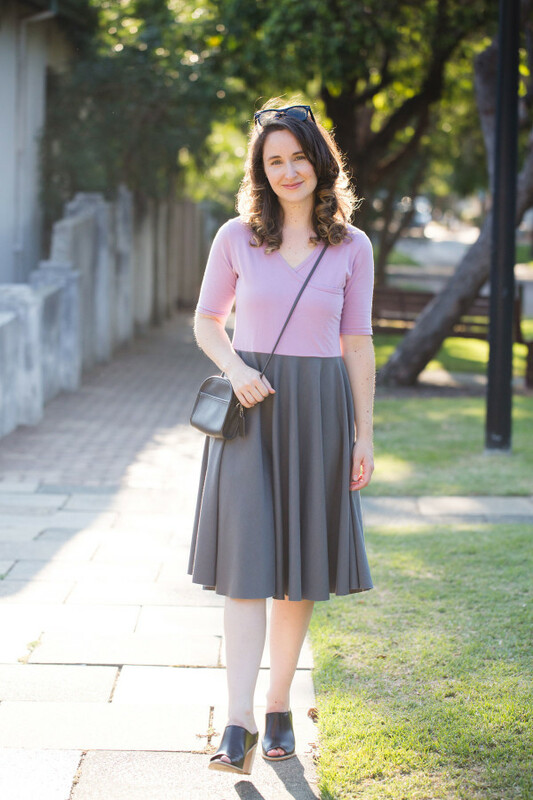 The pattern itself is our simple Veronika skirt – Version 1 with inseam pockets instead of the scalloped pockets. 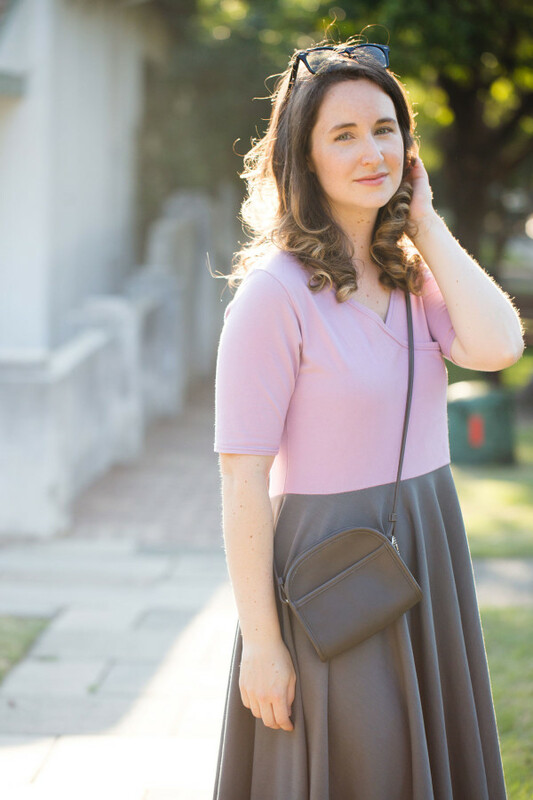 That’s whats great about this pattern – it’s simple enough to be an easy sew – but can really have wow factor depending on the fabrics and finishing you use. The lining is cut with the exact same pattern pieces. It probably wasn’t entirely necessary to include lining – but i’m of the opinion that if you use something lovely like silk brocade, you really should finish it properly and line that puppy. Also horsehair braid is itchy guys. itchy. 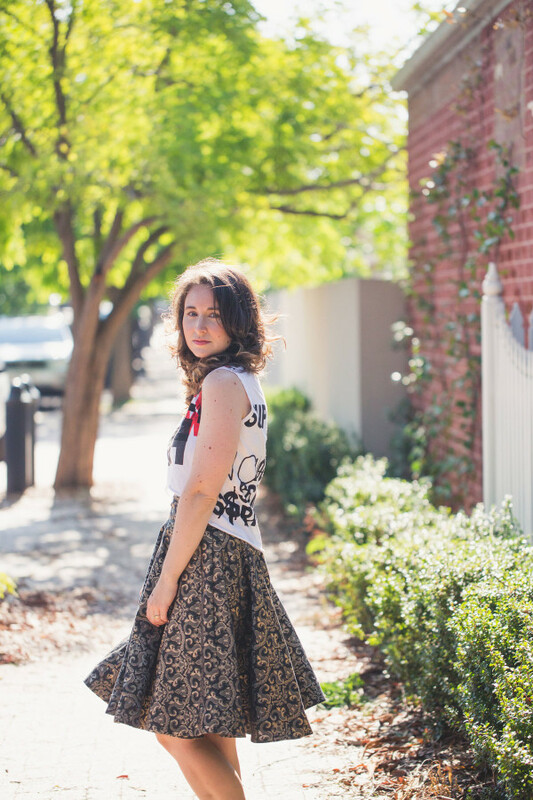 As a side note – i’ve really loved seeing all the Veronika skirts you gals are coming out with! They’re awesome! There is seriously nothing more awesome than seeing you all enjoy a pattern this much! Any time you make a garment cut on the bias there will some stretching out along the bias. If you hem your garment immediately, then this stretching will result in a very uneven hem over time. It’s always best to let your hemline stretch out before hemming – but then the trouble is, how to even it out properly. 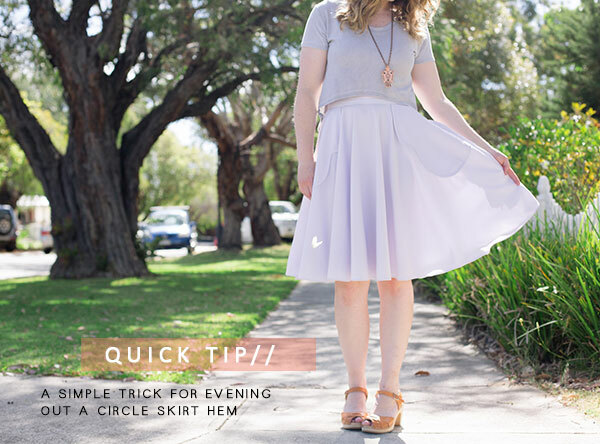 Today i’m sharing with you one of my favourite simple tricks for evening out the hemline on a circle skirt! 2) Lay out your skirt and line up the original pattern piece with it. 3) Using the original hemline as your guide, trim the stretched out uneven portions of the skirt hem. 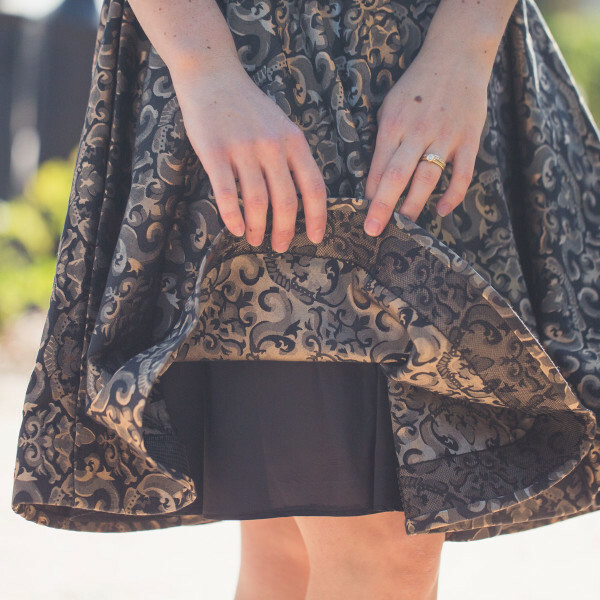 Introducing // The Veronika skirt a FREE pattern! You guys! 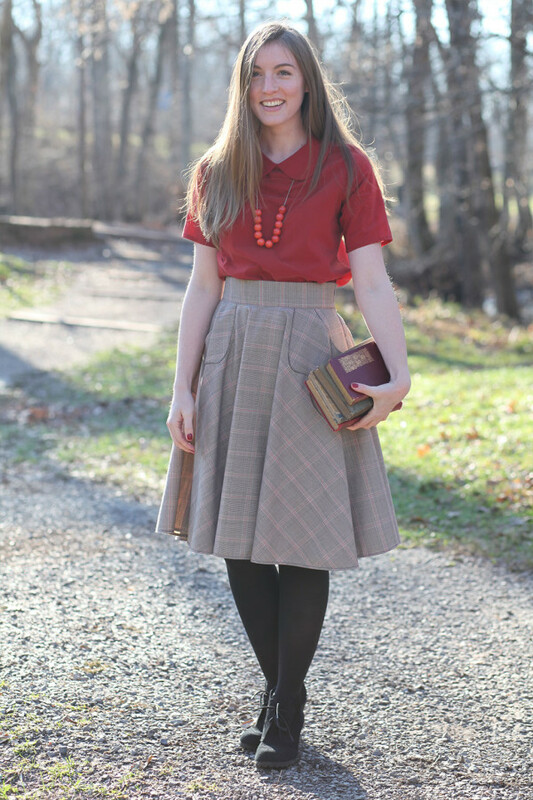 I am so excited to finally release the Veronika skirt sewing pattern to you! for FREE! yayyyyy! We’ve been working on this free pattern for quite some time, but unfortunately had to push it to the side for a bit as we finished with the rebranding/release of the paper patterns. I’m thrilled to announce that it is finished and ready for you to enjoy! 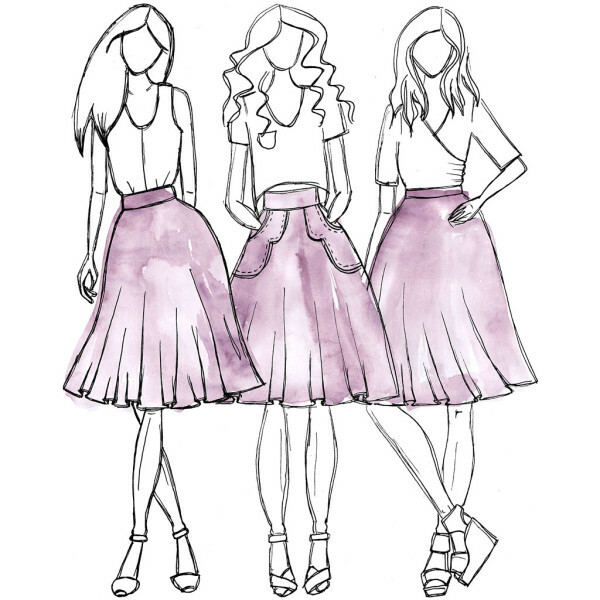 In case you don’t remember – the Veronika skirt is a design that originally featured in one of my ready to wear collections. 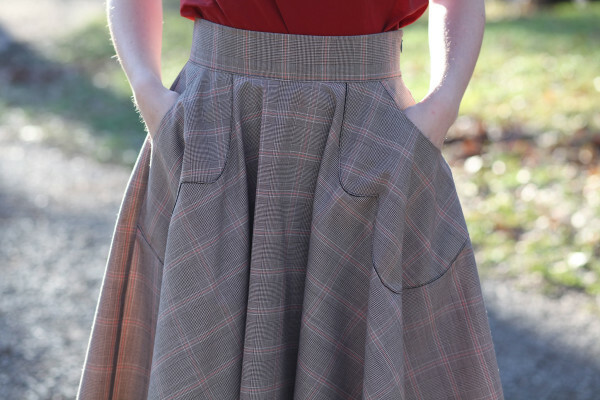 It’s the perfect full circle skirt pattern – a great starter pattern for beginners, or a great base for experienced sewers to use as a jumping off point to add their own details. It’s one i’ve come back to over and over again – and i think you’re going to love it! I decided to name this pattern after my lovely friend Veronika, whose blog was one of my greatest inspirations during the time i first designed this skirt (though she closed her blog Tick Tock Vintage quite some time ago, all her gorgeous outfits are still available on Flickr and she is on Instagram). The pattern includes three variations – Version 1 is for woven fabrics, and features my signature scallop pockets and wide waistband. Version 2 is for woven fabrics and includes a narrow waistband, Version 3 is for stretch fabrics and includes an elastic waistband. I really hope you enjoy this new pattern! Head on over to my store and download it for FREE and don’t forget to try out our app when you’re sewing, we’ve included links to lots of tutorials to help you sew this pattern!